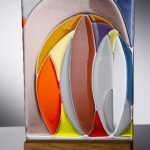 Paul Floyd BA(hons) is a designer and maker based at the Ruskin Glass Centre in Stourbridge, producing bespoke innovative work for interior and architectural commissions. 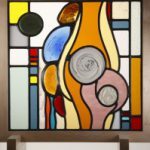 The Studio which was established in 2003 mainly works in glass, designing and making for both residential, commercial and corporate commissions. 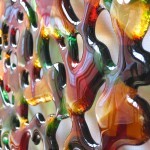 A range of contemporary and traditional techniques are used including stained glass, mosaic, kiln-forming, casting and fusing. 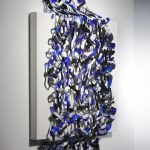 Paul uses these techniques with a foundation of good craftsmanship and works in combination with different materials including wood and metal. Paul is also a member of the ‘Heritage Crafts Association’. 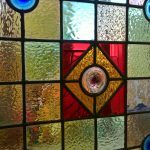 The established and experienced workshop also offers a full repair and restoration service of stained glass, leaded lights, doors and windows. 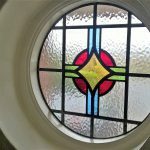 The workshop can also encapsulate traditional stained glass windows into modern double glazed units for upvc, wooden and metal frames. 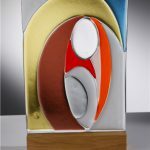 Paul has worked on varied commissions, ranging from stained glass for private clients to bespoke artworks for public art projects. 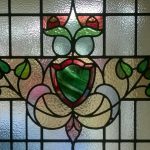 In the past he has designed and made stained glass panels for a ‘Faith Centre’, as part of the public art vision of ‘Project Dandelion’ in Wolverhampton and more recently has designed and made a series of stained glass windows for the ‘Thomas Robinson Building’ in Stourbridge restored by the ‘West Midlands Historic Buildings Trust’. 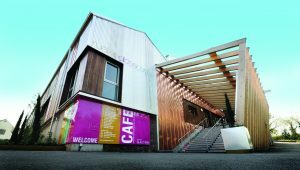 Through these and similar projects within the creative practice, Paul has gained and built on his experience with working alongside architects, interior designers, arts organisations, public, corporate and private clients. 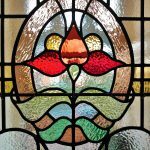 The studio also works with the wider community, local schools and colleges providing glass workshops, courses and creative projects.